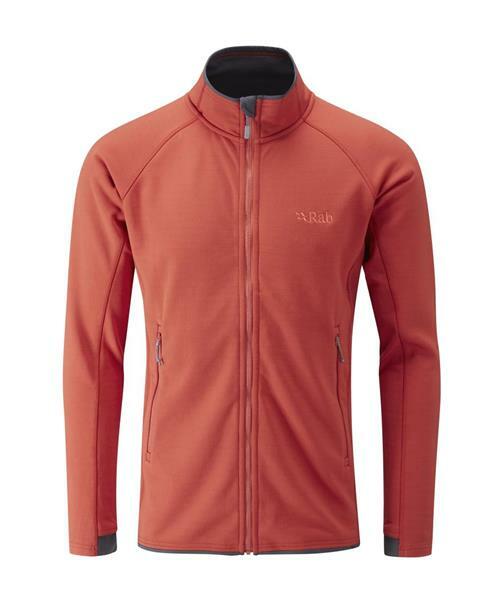 The Focus Jacket uses a unique to Rab® MerinoIN™ fabric technology, to create a lightweight fleece for year round use in your layering system. Sitting at the rather more luxury end of Rab's fleece range, MerinoIN™ fabric is knitted and combines the wicking and durability of polyester fibres with the odour resistant soft nature of the merino wool.This winning blend makes it a classic piece for any keen climber, hill walker or mountaineer, whether it's worn during the crux pitch of an alpine rock route or at the post climb social gathering down in the valley. The Focus Jacket features a high collar and thumb loops to secure the jacket in place when worn as part of a layering system.